« . currently – august 2015 . I like to add cocoa powder to my smoothies as well. I really like that flavor. I ALWAYS need more chocolate in my life. I have been known to eat baking chocolate as well. Desperate times call for desperate measures, you know? I love chocolate overnight oats and thick, cool smoothies. This is totally the best of both worlds! Chocolate chips by the handful always satisfies m random evening chocolate cravings! Of course sometimes I just need a slice of fudge cake. When that craving strikes, I don’t try to deny it! Oh my gosh, I want this so bad right now. I normally don’t eat sweet things for breakfast, but I would sip this all day. Great idea to soak the oats before blending, I bet it makes a huge difference! This looks AMAZING. I wish I MAY be making this right now for dinner. Chocolate for dinner is okay if it has oatmeal, right? Lately I’ve been on a chips and salsa kick – and what would be perfect to wash them down? – why, this melted ice cream-like concoction! That pour shot! Ugh. It looks so creamy and delicious. 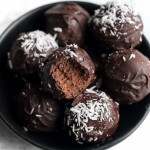 It’s perfect healthy cure for a chocolate craving! I think I have to make this soon!! I just had my wisdom teeth out yesterday, so I am LIVING off of smoothies right now! So trying this one! Thanks for sharing! Now you know I’m a sucker for your smoothies Amanda!! YASSSSSS. I’m a fan of anything that has the consistency of melted ice cream while still having nutritional benefits so it’s easier to justify having for every meal of the day ;). I’m not usually a fruity smoothie person, so this is riiiggghhhhttt up my alley. OMG that sounds just SO delicious – and overnight is always perfect, cause the early hour I raise, I can not really put together a recipe. 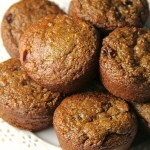 And isn’t unsweetened cacao powder the best thing to use in these recipes?? 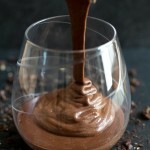 That’s an “overnight oats” recipe no one can turn down 😉 I always add cocoa powder to my overnight oats….really I need chocolate when I wake up every day! At this point I’m not even trying to find excuses for my chocolate cravings/addiction anymore. Or just when looking at how many bars of it I’m going through while actually meaning to budget. … oh well. You had me at ‘melted chocolate ice cream’. I feel I should finally get over my issues and try a smoothie sounding like this. After making some of your recipes yesterday, I have begun to realize that cooking/baking (or in my case, no-bake recipes) are not as scary and complicated as I thought! I will definitely be making this one. And sure, why not just blame my chocolate addiction of a magnesium deficiency… its science right ;)? I’m pretty certain I have a permanent chocolate craving, but it’s been even more intense since we’ve moved because we are riiiiight next to a soft serve ice cream place.. ahhh. The temptation is real every single day. Oh and chocolate smoothies ftw. I have yet to try overnight oats because I don’t like the concept of cold oatmeal. However, this recipe is looks too good to pass up. It looks so luscious! Yum! Oh girl you know I share the struggle…err craving haha!! I can’t imagine not eating chocolate daily and a couple of squares at the end of the night is almost a necessity! It’s been a long while since I made a smoothie but you are making me want to whip out the blender! Love how thick this smoothie looks- more like a pudding if you ask me which is only the best consistency to consume smoothie! Girl, I am so on the same page with the chocolate attacks! I have no shame in eating baking chips straight from the bag! Sometimes, I even bring a “leftover” bag (a bag that doesn’t have enough for a full recipe) into work and put it in my desk! This smoothies looks insanely good though. Like, for reals. Pinned! I love that you know exactly what I’m talking about with the texture! It’d hard to imagine going back to oat-less smoothies! Not a problem at all! I made this in my full-sized blender 🙂 And you can always make a double portion and leave one in the fridge for later. Btw. I wanted to thank your reply yesterday(?) it really helped me a lot! PPS. : (sorry if this is getting kinda long) awesome that you reply to EVERY SINGLE ONE of your comments! Seriously. Kudos. Aww thanks so much for your sweet comment, Cora 🙂 And definitely don’t worry about any sort of blogging struggles you might have — I’m pretty sure that -every- other blogger goes through them, it’s just not always easy to see behind the screen! Mmmm, this looks so thick, creamy, and DECADENT! Yummmo. YES. so much yes to this. I’d love to know how you like it, Jade! You had me at melted chocolate ice cream. I had it for breakfast this morning Amanda and it was absolutely delicious! Oh my! I enjoyed the creaminess and perfect sweetness. I ended up topping mine with sliced peaches for a fresh addition. Can’t say how yummy it was! 🙂 This is definitely going on my regular rotation of breakfasts. Woohoo! I’m glad you liked it, Jade! And peaches sound like an awesome addition. You don’t have… oats?! 😯 But… but… that’s like a staple in -both- of our recipe creation! I currently can’t get enough summer fruit… I’m eating it all day, it’s becoming such an issue! Hmm I have all these chia seeds from Blend. Maybe I should start adding them to smoothies. I had a chocolate smoothie on Saturday. It was delightful. I was over the moon obsessed with your almond joy overnight oatmeal smoothie so obvi a chocolate version is going to be even more stellar! BADA BOOM. Definitely not a bad idea, Nancy! Tossing in some spinach would be a great way to get in some extra vitamins and minerals, and you wouldn’t be able to taste it at all behind the other flavours. Can you blend this the night before rather then in the morning? You definitely could, Milissa. It just has to have a chance to sit for a while so that the oats absorb the liquid and make it nice and thick and creamy. I put this in my vitamin in the morning after adding a frozen banana. It was too thick so I added about another 1/2 c almond milk. I may have added too much almond butter. I just scooped a blob into the jar. I also added some spinach and sweetner. Very chocolatey! This sounds amazing! I don’t have chia but I do have some flax meal…could that work instead? Does the chia give it any special texture that I would miss if I used flax instead? Have you every tried using steel cut oats in your overnight smoothies instead of rolled oats? I haven’t, Nikki, so I can’t really vouch for the results. I want to say that it -should- work, since oats are oats, but I can’t say for sure. Hi Amanda! Do you happen to have the calorie count or approx. 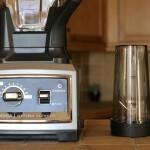 nutritional counts for your smoothie? Also silly question but are quick oats and rolled oats the same? Sounds like an amazing breakfast for on the go! Can’t wait to try it, thank you! Amanda, Your post was featured on Yahoo in our country ( India). Don’t know why, as none of the ingredients are available here! But the pics looked too delicious to ignore. It turned out absolutely wonderful, with consistency the same as in your pics! Is it okay to have this EVERY DAY? It is so good!!!! You saved me with my early morning classes, thank you. I can definitely relate to not being huge on the texture of overnight oats! This is basically like a really thick and creamy smoothie 🙂 And you can definitely switch out the ingredients! I have a few different recipes on my “smoothies” page, and I’m hoping to keep adding to them because they’re some of my favourites. This looks absolutely delicious!! Do you have any advice on how to make it more of a frozen consistency? For example, frozen bananas or ice? Thank you! You can definitely add a frozen banana! If you do, you can probably leave out the maple syrup since the banana will make it sweet enough. Oh my god I’ve just discovered your website and am officially in love. This is sitting in my fridge ready to go for tomorrow morning – I’m so excited to try it. I didn’t have any chia to hand so I subbed a flaxseed and nuts mix – do you think this will have a major impact? Also I noticed in your hemp version of this recipe you blend the night before – would you recommend doing the same with this version? It shouldn’t have -too- big of an impact on the texture, Rachel, but it might alter the taste slightly. And when you blend it depends on what kind of texture you’re after. Doing it the night before makes it a bit more thick and pudding-y in the morning, whereas doing it in the morning makes it slightly more creamy. I made this overnight smoothie for breakfast and it was delicious, thank you for another great recipe! This was TERRIBLE the 1st time I tried it. I followed the recipe exactly! I changed to sweetened almond milk, sweetened cocoa powder, and cut the chia in half. Now it’s great! 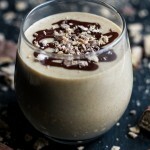 OMG, I love oats and I get to have chocolate and healthy in one glass!! I currently have 2 hours and 49 minutes to wait while it marinates. I’m in love and haven’t even tasted it yet. I’m glad I double checked the recipe because I was going to cook the oats! LOL I wonder if you could use cooked oats. Awesome recipe and blog. I’m also a photographer and all I can say is excellent work! I have a few failed smoothie recipes that just couldn’t thicken up. 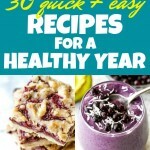 Maybe oatmeal will be the solution… Thanks for the inspiration and recipe! I made this for the first time today and enjoyed it! I did use agave instead of maple syrup. Just wondering if anyone has an easy way to calculate the nutritional facts (calories, fat, carbs, protein, sugar and fiber) in a recipe with out looking up each ingredient and manually adding them up. I have made this every day this week. I substitute the chia seeds for ground flax and I mix in some Silk dark chocolate almond milk. Keeps me full all morning. Thank you for this!! This sounds awesome, and I am ready to try it. Has anyone calculated the nutrition? I need to count calories, carbs, cholesterol, etc.